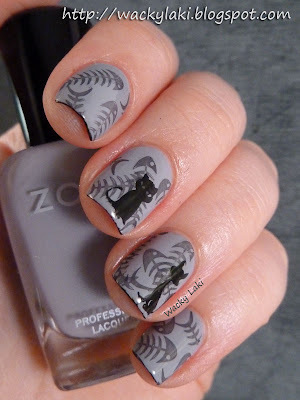 For the base I used Zoya Carey and then randomly stamped skelly fish using Zoya Kelly to create a background pattern. I have been trying to find an occasion to use those skelly fish and I finally found one! I used the fish from Red Angel plate RA-107, but there is an identical one on Shany plate SH02. I'm sure lots of others out there as well. 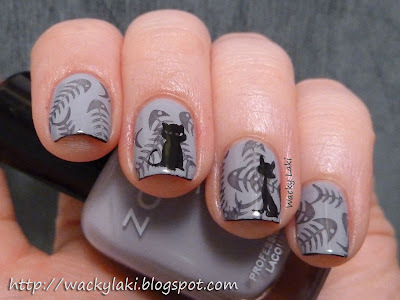 The cats were stamped with Wet 'n Wild Black Creme using Bundle Monster plate BM02 and Shany plate SH08. That is one of the cutest things that I have ever seen!You did a Fantastic job. I love Carey and the way you used the fish pattern! it's really pretty! I love this. The whole thing. The tips are great. I have to try that. I love this! the skelly fish are perfect!! I love, love, love this mani! Great idea for the skully fish background for the kitties. 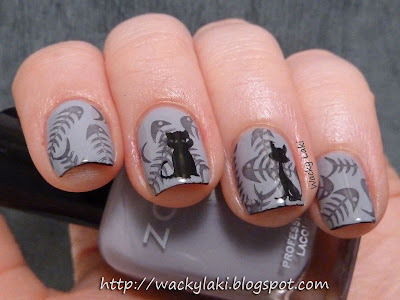 I did a kitty stamping a while ago and I would have love to have added something like this... to it to give it that little extra detail. Nice work! These turned out beautifully!! The skelly fish give it some really nice depth and playfulness, and the kitties are adorable. Wrapping the tips gives it a great finishing touch too! I love everything in this manicure, you did an amazing job! This is really cute! Random question, what program do you use to watermark your photos? Really, really cool! Love how it's monochromatic yet visually interesting. @Joanna King, I use Photoshop to watermark, rotate and crop all my photos.